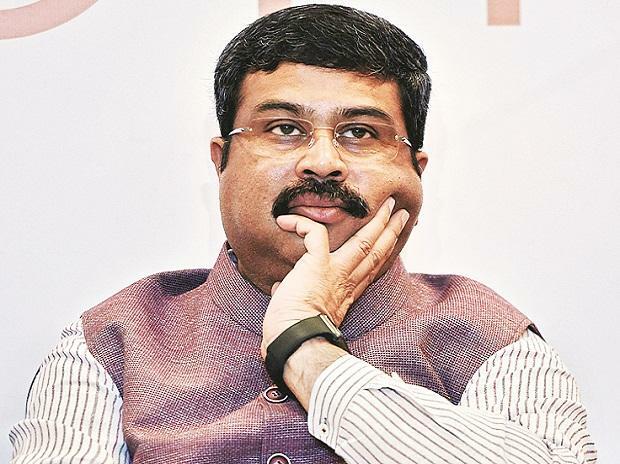 At a time when there is controversy surrounding the listing of ONGC Videsh Ltd (OVL), the fully-owned overseas arm of Oil and Natural Gas Corpo­ration (ONGC), Union Petroleum Minister Dharmendra Pradhan has said there is no such proposal before his ministry. On December 21 last year, the board of ONGC had raised the red flag to a move by the Department of Investment and Public Asset Management (Di­p­am) for listing OVL, citing that market conditions were not ideal for listing an exploration and production company. Following this, there were reports that the government might ask the company to reconsider the plan. “There is no such proposal before the government now,” Pradhan said, responding to a question on OVL listing. In the past three years, Indian companies have acquired assets worth $5.841 billion in six countries including Russia, Namibia, the United Arab Emirates (UAE), Israel, and Oman. Of this, $4.847 billion was spent on two assets in Russia — Vankor and Taas Yuryakh. “The overseas investment strategy by the previous regime was to buy exploratory blocks. This government’s priority is to invest in producing fields. Normally, countries do not give producing fields to anyone. Due to the diplomatic influence of Prime Minister Narendra Modi, we got good producing fields in Russia, Oman and the UAE,” Pradhan said. OVL had a presence in 20 countries with an overall investment of $28.36 billion till the end of 2017-18. “Now, overseas investments of state-ow­ned companies are not only limited to the basket of OVL. We have formed a consortium of companies and made the biggest-ever overseas investment of $5 billion in Russia in the producing fields,” he added. 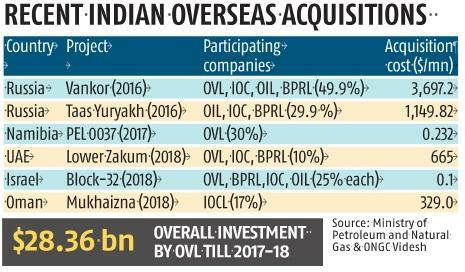 It was in 2016 that Indian companies — OVL, Indian Oil Corporation (IOC), Oil India (OIL), and Bharat Petro Res­ources Ltd (BPRL) — bought 49.9 per cent in the Vankor block in Russia at $3.69 billion. In October 2016, OIL, IOC and BPRL acquired another 29.9 per cent in the Taas Yuryakh block for $1.149 billion. Owing to incremental production mainly in producing blocks like the Vankorneft and Zakum concession projects in the UAE, OVL was successful in reporting the highest ever production of 14.16 million tonnes of oil equivalent in the last fiscal year, posting an increase of 11 per cent in 2016-17. In 2017-18, 56 per cent of the company’s production came from Russia, followed by 12 per cent from Vietnam. Dipam had been pushing for the listing of OVL because it was able to realise only Rs 35,134.76 crore as disinvestment proceeds against the target of Rs 80,000 crore for the current financial year, based on the latest data. A key reason behind the ONGC board’s opposition to the move to list was that key assets like the one in Mozambique will start from 2022. OVL is expected to invest around $4.5 billion to develop the Golfinho-Atum field in the Rovuma Area 1 Offshore Block.